I am a theatre director and I write plays that I want to stage myself for the actors that I enjoy working with. I am interested in writing about and with people whose story has not been performed: juvenile offenders in prisons, Roma children from villages without electricity who do not even know how to write, Jewish people sold or not by Ceaușescu to Israel state in the 70s, prostitutes from the Bucharest’s beltway, priests expelled from the Romanian Orthodox Church. See below all the activities involving Andreea Vălean in the frame of Fabulamundi. 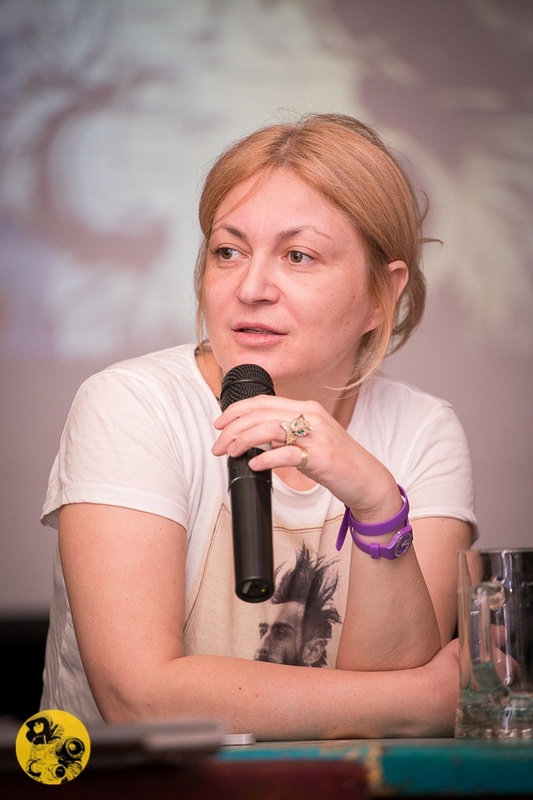 Andreea Valean is a well known playwright and theater director. She graduated the Academy of Theatre and Film, Bucharest and is one of the founder members of dramAcum, one of the best projects in the field of contemporary theater in promoting young directors and emerging playwrights. She is also an appreciated and awarded scriptwriter and producer in cinematography. 2012 touring with the performance “Ciorica/ caravane of dreams”, a puppet show based on a gypsy folk tale. We tour in more than 60 remote villages and performed for more than 1000 children that attended for the first time in their life a theater performance. May 2011 Hungarian Theatre in Cluj, “Rosia Montana” director. The performance won the prize for best performance in the International Theater Festival in Timisoara. 2004 Jewish Theatre Bucharest “The Last Game of Taroc” with the support of the European Association for Jewish Culture (writer, director). March 2002, participant at Ohrid (Macedonia) workshop for children plays. I wrote the play “Kiki and Bozo”. The play was translated in Macedonian, Albanian and English. March 2001, the play “Conspiracy in the Synagogue” was nominated as The Best Play of the Year 2000 in Romania by UNITER. It was translated in English, German and Hungarian. “If I Want To Whistle, I Whistle”, probably one of Andreea’s most popular plays, which inspired the homonym award-winning feature film (Silver Bear, Berlin Film Festival 2010), was based on a study that she made on the young criminals from the Romanian prisons. The play was published in the volume “Balkan Plots” by Aurora Press London. ‘Kiki and Bozo’ is piece about confrontation with death, about last journey, about correcting mistakes in the point when you have to even the score. An old man Bozo and the girl Kiki are near the sea. Bozo is going to the sea to die, and Kiki escaped from everyone because she is afraid of the death of her dog Nini. They spend little time together, but it’s enough for them to realize what death is, but also what are the friendship and love. Orchestra that plays all the time on the stage represents the soul of the old man Bozo. He eventually gives his soul to Kiki and with that gesture he is not only giving himself a new lease on life but he also gives to Kiki priceless value of understanding that the main characteristics of life are that it is momentary and imperfect. Few years ago I wrote a text inspired from my grandfather’s life and his friends’ “Conspiracy in the Synagogue”. I was fascinated by the way he has gone through life and through all bad jokes that history played on him. The accentuation of anti-Semitism in the 30’s and the Jewish enrolment in the communist party seen as a chance for them to escape it; the detention period for the fact that the communist party was illegal in Romania; the deportation in Transnistria at the beginning of the 40’s; the liberation in ’44 after which, many of them changed their names pushed by a desperate wish of history not being repeated with their children; the communist period after 1944, when a new detention period followed for those who were “more communist than necessary”, meaning those who told it like it was; the difficulties through which those who wanted to emigrate to Israel in the 50’s had to go through; the diminishing to extinction of the Jewish communities; the solitude of those who remained behind and the period of the so-called “anti-Semitism without Jews”. Most of their youth, these people have fought with a history that was against them, but this didn’t cause them to lose their appetite for living and to stop enjoying the beautiful side of life. Through “Conspiracy in the Synagogue” I wanted to tell their story.